This ActiveX audio capture component lets you incorporate audio capture functions in an application. 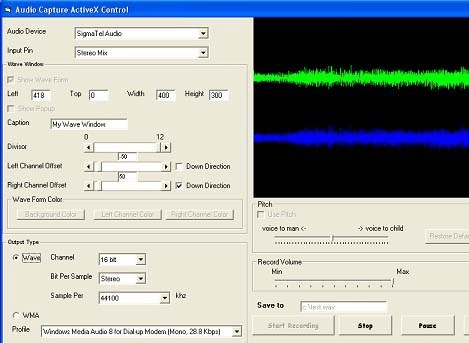 Audio Capture SDK ActiveX 4.0 works with Windows 9X, XP, Vista, Window 7, and Window 8. Windows developers can integrate audio capture, record from audio input pin etc. into their applications. Line In , Microphone, Stereo Mix, Mono Mix, Aux, Video, CD Audio, Phone Line in puts can be easily captured. In addition, you would be able to offer audio capture from the speaker. The sound card you are using for the application need not have a mixer. The functionality will be offered through the SDK. Audio capture can be done in any one of many audio formats including WAV, WMA, MP3, etc. the SDK lets you integrate waveform displays for the captured audio. The display waveforms are presented left to right in two channel format the left and right. This waveform display is customizable and allows you to change background color, left/right channel`s waveform color, offset, divisor of waveform, etc. You can choose to have a floating popup waveform window or child style of waveform window. Volume control for the mixer line can be implemented. Multiple audio devices and mixer lines can be implemented, if you like. Audio pitch changes over a range from male voice to female and child is possible. Audio recording could be paused or stopped as desired by the end user. Sample source codes are provided in C# 2010, c# 2005, VB.Net 2010, VB.Net, VFP, VB, VC, Delphi code. Distribution of your product will be royalty free.